A Lancashire lass in clogs and shawl being “escorted” through Palace Yard. For Women’s Rights” anything we will dare; Palace Yard, take me there! Parody on “Take me back to London Town”. The suffragette in this postcard has been identified as Dora Thewlis, aged 16 at the time of the postcard, otherwise known as ‘Baby Suffragette’. She was actually from Yorkshire not Lancashire. This postcard is used as a cover of Jill Liddington’s book ‘Rebel Girls: How votes for women changed Edwardian lives’ and she has information about Thewlis. Several newspapers marked the release of her book with articles about Thewlis: The Independent (8th May 2006) carries an article entitled ‘Dora Thewlis: The lost suffragette’ and the Daily Mirror (10th June 2006) has an article entitled ‘The baby suffragette’. 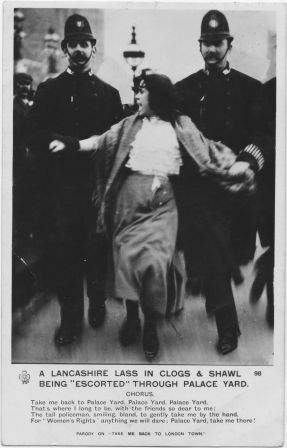 McQuiston (Suffragettes to She Devils, page 26) has a copy of the postcard and writes that it was probably taken at a demonstration outside the House of Commons in 1907. The protest was at the failure of a bill introduced by W.H. Dickinson in March. She notes that it is unusual as it features a working woman. McDonald (Vindication! A postcard history of the women’s movement, page 37) feels that the card ‘marks a significant change in postcards of the movement by showing the involvement of working women and the authority of the police’. 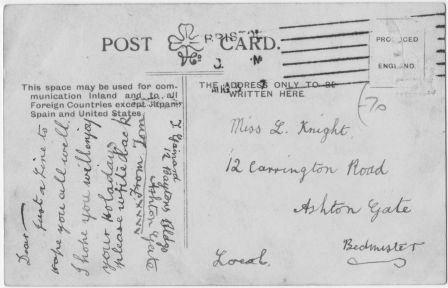 McDonald adds that it was also an early example of ‘news’ being made into a postcard.